Capture has been traditionally deployed in our local mail rooms; however, as we move to a distributed work force organizations are realizing that their remote workers also require capture functionality. With the release of LEAP Snap we offer a cloud based capture solution that will meet your organizational capture needs. 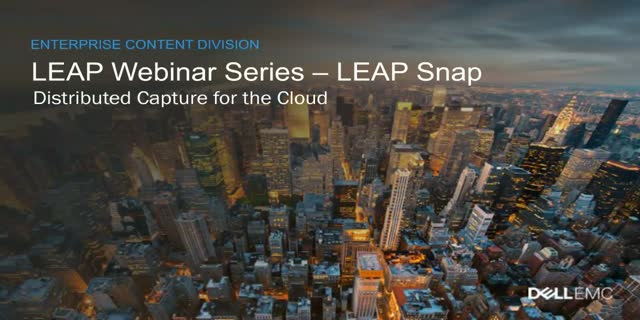 Dell EMC's LEAP is a platform that responds to the changing needs of organizations as they move from the classic content management offerings into this new era of lightweight, cloud, purpose-built apps that deliver on the promise of content for all. Snap supports real time auto-classification and data extraction to support any immediate business processes & needs. Join our session to get an overview of the LEAP Platform with a focus on Snap. LEAP, is a suite of purpose-built, cloud-native content apps designed to revolutionize the content management industry and transform interactions with business content. Concert, allows multiple contributors to collaborate structurally on a single version of a document by easily dividing and assigning sections to individuals. Concert can be used for RFPs, Product Launch Documents, Contracts, Clinical Trials or similar use cases, bringing order to these collaborative processes while freeing participants to do their best work. Divided documents, workflow notifications, and authoritative controls are all combined to prevent unauthorized or unnecessary content changes. Watch and learn how the LEAP family of products will power digital transformation strategies, while creating new value proposition across the larger ECD portfolio. Attend this session to learn the value proposition for our new LEAP family of products and to understand why and how LEAP will bring value in the context of digital transformation. We’ll also explain the role of the LEAP family within the larger ECD Portfolio. Content exchange without chaos. Leap Courier offers a new way to power business processes that depend on structured document exchange across organizational boundaries. It provides a consumer-grade user experience for secure and structured document exchange, validation and tracking. It is easily adaptable to different use cases, configurable in minutes without any additional development. Document viewing designed for mobile. Reading, section jumping, and reviewing content on mobile phones has never been easy – until now. LEAP Focus replaces pinching and zooming with a responsive mobile experience that’s perfect for whatever device you use for whatever long-form business document. No laptop required. Content access and subsequent approvals are often more friction-filled than they should be. LEAP Express delights casual and infrequent users with its ability to easily browse, search, and approve all content, anywhere, anytime. It’s repository-agnostic, eliminating the need to jump across multiple content apps, and it supports approval workflows from D2, Documentum, and solutions such as Life Sciences. IT document capture solutions are complex. As a lightweight app, LEAP Snap overcomes this problem in minutes while still delivering the enterprise-grade development, test, production, template, and configuration features your business needs. Exchanging mortgage, insurance, or other business content can be chaotic. LEAP Courier improves this exchange by delivering a visually rich, clearly marked, and easy- to-follow experience so you don’t have to settle for risky sync and share solutions. Learn how these thoughtfully designed applications can drive productivity and solve your business challenges.